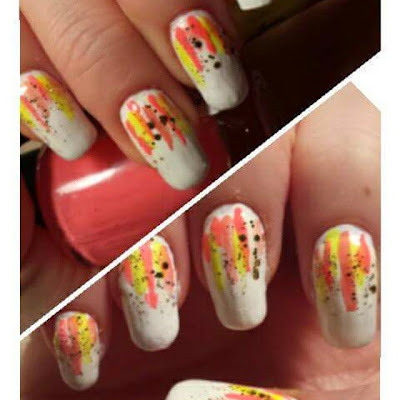 I just recently found out that these are called waterfalls nails! There are literally countless combinations of color to make this. I plan to do lots more waterfall nails with different color. For this design, I used a white base, and yellow and orange stripes. Some stripes turned out to be messy and this was when I thought, "Glitter always make things better, right?". So I added some gold glitter stripes as well and it turned out alright, I think! Next time I will try with to do a darker waterfall manicure!